Was it good for you? If “it” is the summer movie season, and “you” are a major Hollywood studio, the odds are that the answer to that is a resounding “No.” As we officially exit that season and enter fall, it's the last chance for box office glory for a while, but as is typical, Labor Day weekend lives up to its billing as the weekend studios would really rather forget about. If the weekend's terrible for films, why not get a jump start on it? That seems to be the theory behind the Wednesday release of The November Man, a Bourne-like international thriller based on a Bill Granger novel. It stars Pierce Brosnan as an aging (does he play any role without this adjective tacked on now?) CIA agent pulled in for the mythical One Last Job, to protect a Russian double agent who holds the key to bringing down the next President of Russia. This brings him into conflict with his former protege (played by the Australian Paul Walker, Luke Bracey), working for a separate branch of the agency that clearly has a different mission statement. Which side are the good guys; which side are the bad guys? Who cares? Let's shoot at each other. Directed by Roger Donaldson (he of the sublime Thirteen Days and the... less so The Recruit) and also starring Olga Kurylenko and a host of random European actors, it has the look of a fairly disposable, possibly straight-to-video, thriller from the mid '90s when international intrigue was all the range. The specialness of Bond or Bourne just simply isn't here. To a large extent, the jury is already in on the performance of this film, with just $862,000 coming in from Wednesday showings. That is, not to put too fine a point on it, quite terrible and doesn't inspire a lot of confidence for the weekend. Typical patterns would put this at about $3 million for a regular three-day weekend, and even if we tack on the holiday Monday that doesn't get it to $4 million. While it's not excessively budgeted, this isn't a result that leads to any positive spin whatsoever. 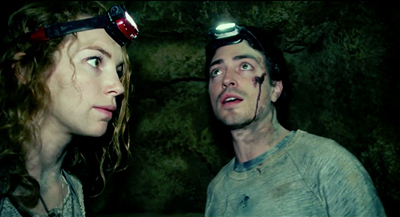 The opening film with better prospects is As Above, So Below, a found-footage horror film set in the catacombs of Paris. As a team of young archeologists hunt for clues about some historical something or other (does it matter? ), a cave-in causes them to go off track, wherein they stumble across some messages about the gates of hell. But hey, that's just some old scare tactics, right? Right?